I live, and write, in the beautiful Scenic Rim Region, in southeast Queensland, Australia. My small property is surrounded by rolling hills, with dramatic mountains in the backdrop. With misty mornings, spectacular sunsets, and the Milky Way just beyond my fingertips in the evenings, it is very hard not to be inspired. Tessa Howard survived a horrific car crash, although her parents did not. Everyone thought that it was a miracle because she suffered no injuries at all, despite the car being crushed beyond recognition under the trailer of a truck that had jack-knifed across the road in front of their car. Having few memories of the accident and the death of her parents exhausted her emotionally. Experiencing despair, anger, guilt, anxiety and fear, it certainly wasn’t a miracle to Tessa. While trying to move on with her life, one peculiar coincidence after another draws Tessa closer to the enigmatic Sam Archer, until she discovers a hidden truth about fate and free will. 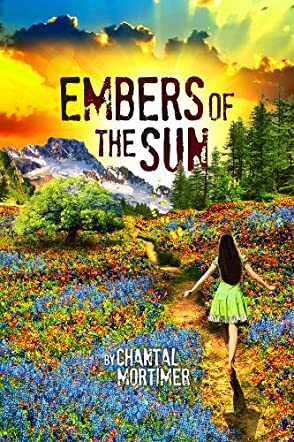 Chantal Mortimer’s Embers of the Sun starts off as puzzling as protagonist Tessa Howard. Even though she sees Sam Archer as the unfathomable one, Tessa herself is a riddle to readers. There’s more to her than meets the eye, and it seems only Sam knows about it. Generally, I favor a fast paced story, yet the surreal cloud around the plot more than made up for it. The intrigue of Embers of the Sun kept me engaged from start to finish. There’s also an element of humor that threads through the witty dialogue, which I always appreciate in a story. Mortimer’s prose is unhurried, faultless and engaging. Personally, I think her writing style is wide ranging enough for a different demographic of readers. On the whole, a great read that one can easily enjoy and I look forward to Mortimer’s other work.